Wild garlic is literally my most favourite ingredient this time of year. Its growing season is so short that our fridge is always stocked up with a wild garlic pesto throughout spring. The pungent leaf is so versatile that it can be used to stir through a risotto, put in a salad or soup or simply popped in a toastie! My favourite way with wild garlic is – pesto. No contest. 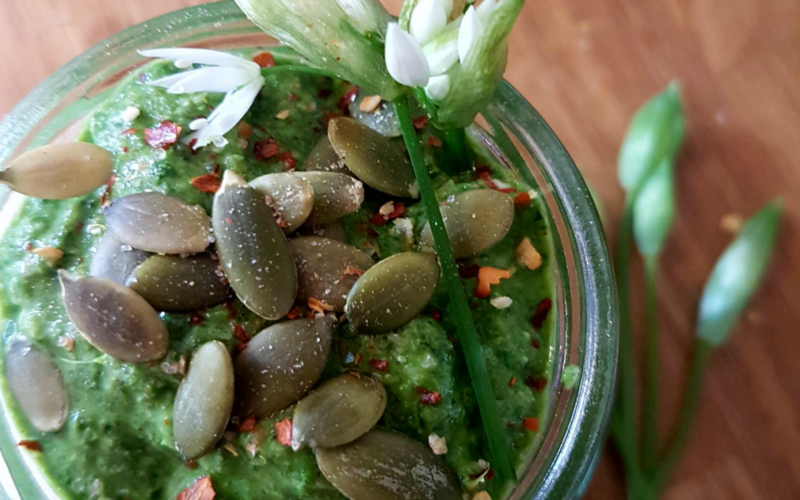 This vegan wild garlic pesto recipe is so simple and yummy that all the family can enjoy it. You can use the pesto to dress up a simple salad, to stir in through pasta/veggie noodles or to spread it on to crusty bread and top with chopped tomatoes to make a bruschetta with a twist.